We are publishing this article especially for younger comrades who have not had the fortune to directly encounter the strong and lucid character of Onorato: this memoir is a testament to how our unforgettable companion was esteemed – as we read – for his "moral integrity, political inflexibility, educated personality". Besides that, and for us of fundamental importance, was his "clear doctrinal rigour": a resolute example of theoretical and political coherence that, today as yesterday, sustains us through the difficulties of the hard work of building the Revolutionary Party. … In memory of the consistent figure of Onorato Damen, Communist fighter ejected from the Church of the PCI in 1931, who died on October 14, 1979 in Milan aged 85, after sixty-five years of struggle in the Italian and international labour movement, including twelve years in prison, ten in confinement, as well as fascist ambushes and persecution: events which had earned him the label of “unrepentant Communist" from the regime’s police. But for that Church, even before his death, Onorato Damen was buried among those "who were never alive." In vain we tried to find traces of him in the Encyclopedia of Antifascism and Resistance, founded by the staunch Stalinist, Secchia. And if in the Biographical Dictionary of the Italian Labour Movement, published by Editori Riuniti, a tiny article refers to his name, there is no mention of the important reasons for his dissent, firstly "par excellence", towards the party, then aimed at Amadeo Bordiga, and finally at the height of his heresy, directed towards the heirs of Bordigism, with his own version of Marxist and Leninist orthodoxy, an absolute version of an absolute doctrine. Only in semi-clandestine (as regards dissemination) periodicals of the tiny groups of the internationalist diaspora, Prometeo and Battaglia Comunista, could his writings appear, with a polished doctrinal and polemical rigour, and only in the press of the free left, yesterday in Social Critique, today in Pietre, is he reinvoked; yes, as a dissenter, but respectful and appreciative, a man of moral integrity, political inflexibility, a cultured personality. Trotsky, exiled and hounded by GPU agents in countries that granted him asylum, from Constantinople to Oslo to Mexico City, still attributed the rise of Stalin’s military and police despotism to a bureaucratic-oligarchical degeneration. He based his desperate battle for the restoration of Leninist dialectics within the Party and the International; while Bordiga and the European Communist left were inspired by the Kronstadt revolt and the original "workers’ opposition" in the midst of the October Revolution. They forgot the harsh Leninist analysis of extreme left in "the infantile disease of communism” – and substantially shared the Trotskyist platform in rejecting the idea of a capitalist turn in the Soviet economy, seeing the distorted character of the Stalinist regime only in industrialisation and forced accumulation. Onorato Damen lucidly denounced the tragic reality of the revolution that denied its origins, which became a counter-revolution, a dystopian, imperialist State in which capitalism weighed with iron laws on workers and peasants, more than ever, subject to super-exploitation and alienation. He (Damen) did not see himself as part of the Trotskyist diaspora and in the countless groups and Trotskyist factions that branched off in Europe and America, giving rise to a long succession of wounds and divisions, everywhere infiltrated, pursued and murdered — as in the case of Leon Trotsky, his son Lyova and many others – by the long reach of the tyrant's vendetta: Damen saw the facts clearly, without making any concessions on principles. The Russian Revolution had undergone its Thermidor. The Church, which became the State, had established its Theocracy, its theological truths. Following in the footsteps of all churches, with power over the flesh as well as spirits, it was impenetrable, steeped in its own dogma, counting on the prop of a formidable, increasingly powerful, secular, armed apparatus, ready to extirpate heresy and dissent. In Soviet Russia, the terrifying "great purges" of the 1930s, bring us back to the darkest centuries of the Middle Ages, to the bloody repression of the Gnostic, Marcionite, Nicolaite and Arian heresies*: grim, atrocious pages of superstitious fury; subtle and sophisticated disputes on substance and on form, on principles and objectives, on good and evil, which still demanded the eclipse of reason, the blood tribute, fratricidal feud, slavery of thought and works, banishment, hunger and death. The total rejection of Stalinism, and its Togliatti derivatives, which in the 1930s link Damen to Bordiga, was followed in subsequent decades by insights and clarifications of a wider horizon, not just on the essence and consequences of the Soviet trajectory, but on the fundamental principles of doctrine: the interpretation of Marxist dialectic, the famous diamat. It was the rupture between the two, historically documented by correspondence in 1951 between Alfa (Bordiga) and Onorio (Damen): five letters in which the Bordigist "mathematical", conception of revolution which comes about by itself so one can wait for it with arms folded, is opposed by Damen’s vision of motion and contradiction, demanding action and struggle, a fighting party, a conscious proletariat. 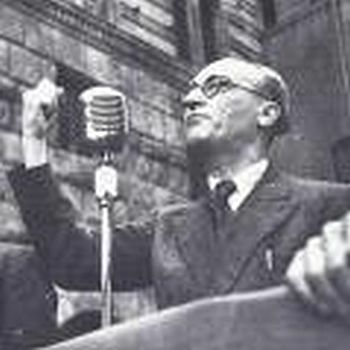 Disagreement extended to different conceptions of the nature and duties of the Revolutionary Party and of the Trade Unions, and in the 1950s became irreversible, creating a new split in the Internationalist Communist Party: the split in the split, with Damen "solus sed non solus", on the one hand, Bordiga on the other. The three points of disagreement separating them date from the Second World War, when the Communist left revived to reweave the cloth ripped apart by fascist persecution, and become clear in 1952. They were: the concept of dialectics and the supersession of praxis; the concept of the dictatorship of the proletariat through the political surrogate of the dictatorship of the party; The attitude of the class party as regards Russia, a great military power, and in its own way colonialist and imperialist. So, a consistent fighter; a clear writer and speaker, well researched, without demagogic and rhetorical smoke; a serene and deeply honest man, exemplary in his profession – teaching in middle school – and in life; with the intelligent collaboration of his wife, who had suffered with him the harsh events of the fascist period and all those who shared his ideas, he created periodicals of their diaspora, and he was at the same time manager, proof-reader, distributor, as is the fate of poor and small parties (as was the case with all the contributors), following in the footsteps of the rest; of Gambo, Turati, Prampolini, the pre-fascist Bordiga himself. The man conceded nothing to the opponents but freely engaged in dialogue with them, without contempt for the opinions of others, which is only for fanatics of all churches. His irony was not corrosive, but simply human. And this essay summary of his work, inspired by a long friendship born in 1940 in a concentration camp (of Marine Istonio, alias Vast d'Abruzzo) (8), is meant to be a continuation of a thirty year dialogue in respect of our mutual opinions and the mutual recognition of the dramatic prospects for Italy, for Europe and for the world, unfortunately arising from the betrayal of the ideals of that October 1917 which both we, and millions and millions of people, had hailed in our younger years as offering immense hope of justice and freedom. (1) For those who wish to learn more on the topic we recommend: Onorato Damen, Bordiga: Beyond the Myth, now in English and available from our website. (2) See Panfilo Gentile. History of Christianity Ed. Rizzoli, Milan, 1975. (4) Damen, op. cit., p. 74. (5) See Giorgio Galli, Alternative Histories of the P.C.I. in Social Criticism. #3. 1972. Galli is also quoted on p. 85 of Damen op.cit. (7) See Damen, op. cit. From the flap of the inside back cover of the Second Edition in Italian. (8) In the wave of Mussolini’s rediscovery of all things Roman, an extensive ancient Roman municipality was renamed Histonium. Originally from the Frentani, the Italian population subjugated and colonised by the Romans at the time of the "social war" (between 130 BC and the beginning of the common era). The fours heresies were all condemned by the early Church in the Fourth Century AD but various theologians continued to be condemned by the Church as exhibiting these and many other obscure heresies right through to modern times. Can anyone give a brief history of the theory that the Soviet Union had become a capitalist state? From limited reading, it seems that Kautsky came to that analysis relatively early, but I was wondering if Damen came to this conclusion independently or as a result of other influences. He became more articulate on this as part of the process of the formation of the PCInt and it was the subject of the the Five Letters he exchanged with Bordiga (alos on the site) where he was trying to get Bordiga to make a marxist assessment of the the USSR (and not just Bordiga's meaningless (from a class viewpoint) description that it was an "industrialising society). This seems to coincide withe period where CLR James was rejecting Trotsky's theory on the USSR. He then stayed in the United States until he was deported in 1953. By 1940, he had begun to doubt Trotsky's view of the Soviet Union as a degenerated workers state. He left the SWP along with Max Shachtman, who formed the Workers' Party (WP). Within the WP, James formed the Johnson-Forest Tendency with Raya Dunayevskaya (his pseudonym was Johnson and Dunayevskaya's was Forest) and Grace Lee (later Grace Lee Boggs) to spread their views within the new party. Damen's views preceded the Johnson-Forrest tendency by a decade. But Dunayevskaya came to Milan in the 1950s and Damen arranged for her to address factory workers in the factory groups there. Marx established that as long as the proletariat did not rule production, production knew and could know no other method of progress but the increase of constant capital, machinery, mechanization, at the expense of variable, living labor. The only revolution which could save society was the proletarian revolution in the process of production. Further he showed that this system not only created the violent clash in social relations. Inevitably the rate of profit would fall and (theoretically) at a certain stage the economy would not be able to expand any further because it would lack sufficient surplus value. In his strictly logical theory Marx expressly excluded any idea that the system would collapse because goods could not be sold. In his analysis of collapse he made it absolutely clear that the capitalist could sell all the goods he produced. This would not alter the conditions of the workers in the factory. It is possible to keep silent about this, but to deny it - that is impossible. The Stalinists do not go so far. All Marx's theories of crisis, overproduction, commercial-crisis, etc., to which he paid careful attention, all are based on this foundation of relations in production. All his opponents, however differentiated among themselves, are united in this, that they see the solution of the crisis of capitalism in every conceivable place except the reorganization of the productive process by labor itself. From Section 1, Chapter 1, Vol. 1 of Capital, this is precisely what Marx opposed. The very categories he used, and the content he gave to them as categories of exploitation, were derived from his analysis of the mode of labor, and without it he could not have succeeded in defeating all his opponents. It is obvious, therefore, that the Marxian theory from its very elements is an invincible weapon against the capitalist class or a usurping bureaucracy, whether the property is private property or state-property. It is equally obvious that a bureaucracy, caught in the throes of economic crisis and in the name of Marxism exploiting millions of workers, has a deadly enemy in this theory. If the Marxian categories apply to Russia, then it is a simple matter to say that Russia is a form of state-capitalism. The Marxist categories therefore become for the Stalinist bureaucracy the concrete theoretical enemy.